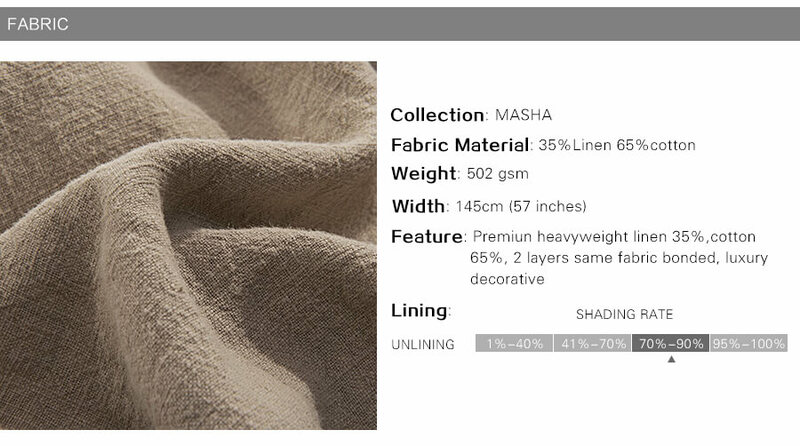 Premium heavyweight linen 35% and cotton 65%,. Double layers same fabric lined to enhance weight, fabric weight 500 gsm. Each panel has 8 adjustable hooks. Tenacious plastic hooks have a ratchet system to make them adjustable. Hooks easily installed and removed to control spaces between each other to create folds and waves. 1-inch side hem, 4 inches bottom hem, perfect and professional tailored. ChadMade also provide size and heading custom service only for those listings fulfilled by Seller. It's easy and quick to order custom made product which could fit your window perfectly. Provide us following information. 1.Heading: Nickel Grommet/Anti-Bronze Grommet/Tab Top/Rod Pocket/Goblet/Pinch Pleated/Back Tab/Plain Hooks. 2.Single Panel Width:__inch or __cm.Measure your rod or track,and decide curtain width.Normally curtain width need to be wider than rod or track width for fullness. 3.Single Panel Length:__inch or __cm.See following guide on how to measure length for different heading styles. 4.Curtain Tieback: No or Yes(standard size 3x18 inches). 1.For grommet,the inside diameter of grommet is 1.6 inches,outside 2.7 inches, 8 grommets in a 52 inches wide curtain. Measure the drop from the top of pole to where you want curtain to finish. 2.For tab top,the height of tab is 4 inches,and around 6 tabs in a 40 inch wide curtain. Measure the drop from the top of pole. 3.For rod pocket and back tab,the height of pocket is 3 inches to ensure rod could pass through. 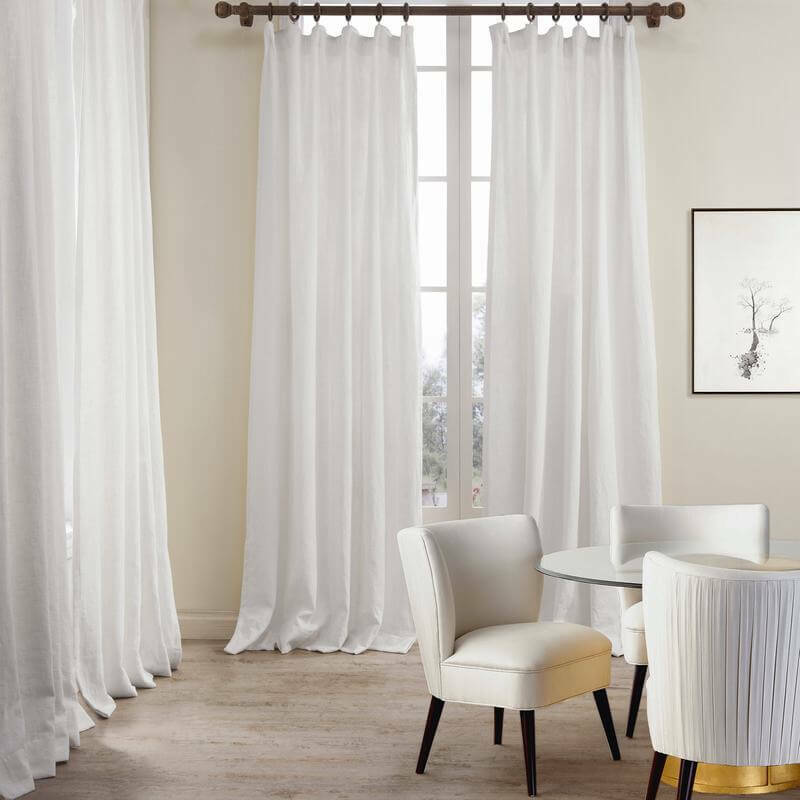 4.For pinch pleat and goblet,there are around 6 pleats with firm adjustable plastic hooks in a 40 inches wide curtain. The panel width is the width that pleats are already set in the panel. Measure from the eye ring where the curtain hooks attached. 5.For flat hooks,come with firm adjustable plastic hooks. Measure from the eye ring hooks. It could create folders without pleats. 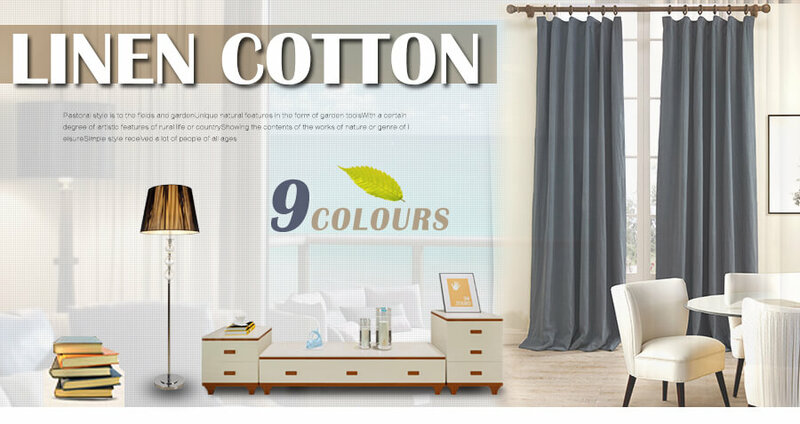 I love these curtains, very high quality, great saturated color, thick without being stiff, natural material, pleasant to touch. Very pleased! I was searching for white curtains that let in light but wouldn't allow my creepy neighbors to see in my windows. I bought and returned at least three sets that were too sheer or too blackout. 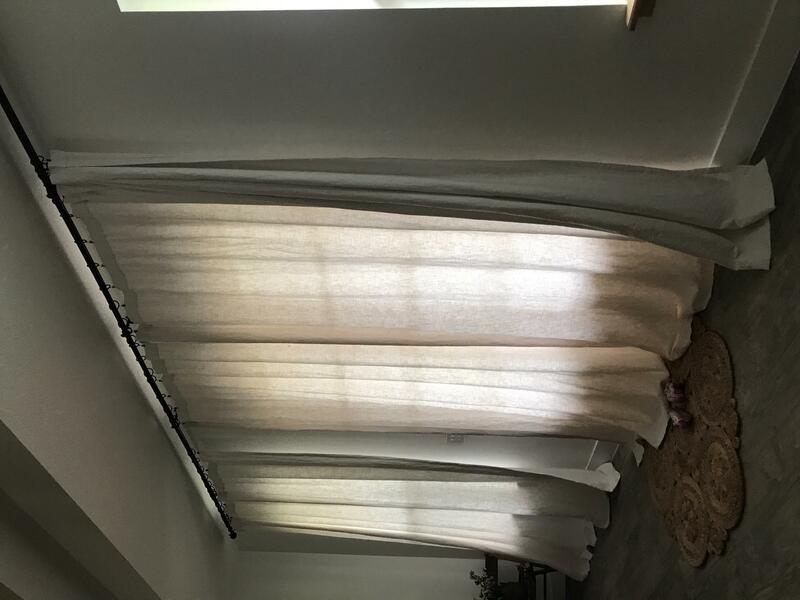 These are heavy curtains, but the sunlight gets through so you don't feel like you're in a cave, but they are absolutely not sheer at all. No one will peep on you with these babies! Cannot recommend enough! I bought the cream color to help keep the heat in. They have 2 layers and are made beautifully. I will be buying more! She is even more pleased with them in person. Going to make the dining room pop with the new floors. Very well made, heavy but not overly so. Heavy and good looking. Love texture as well. Its a keeper. I bought the French Blue option and put these in our guest bedroom that's been painted Let In Rain by Sherwin Williams. First, I was a little worried it would be too much blue on blue, but I'm really happy with the results. 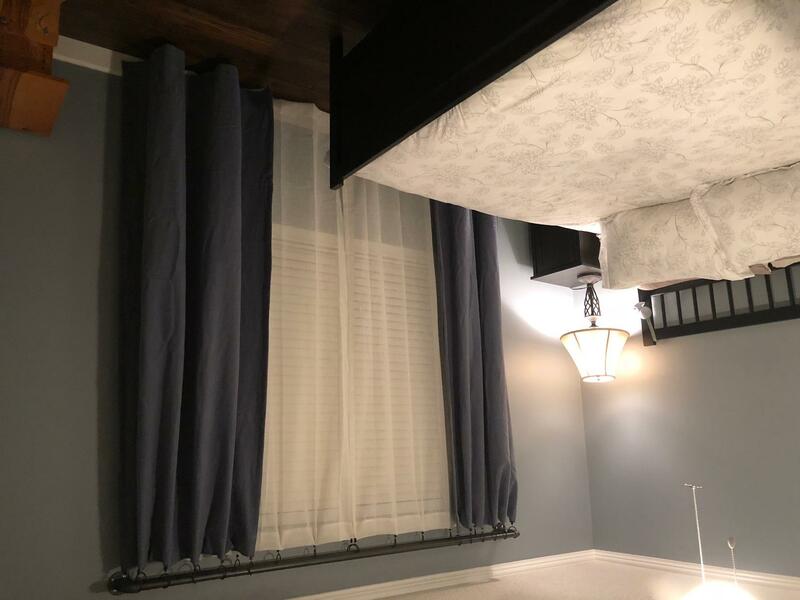 These curtains are not black out, but they certainly are room darkening - especially if you have a curtain rod that wraps around (like the double rod industrial style one I built). Personally, I've never spent this much on window treatments before. Even the panels I have from West Elm cost less, but these panels are beautiful and they look/feel very expensive. Worth it in my book! These curtains are amazing. I still love them even after 2 years! After I had bought two at first, I realized I’d like more, so even though there were only two longer ones (that were longer than my window needed), I still got them because of how amazed I was with them that I didn’t and still don’t mind the length. I just had searched forever and these are the pure 100% linen curtains of my dreams. I’d youre looking for the same thing, these are it! Beautiful natural curtains! They need some ironing but are thick and great quality. Very pleased with this purchase. Great curtains. It isn't easy to find 100% cotton at an affordable price. They look great in my son's room. Wow. 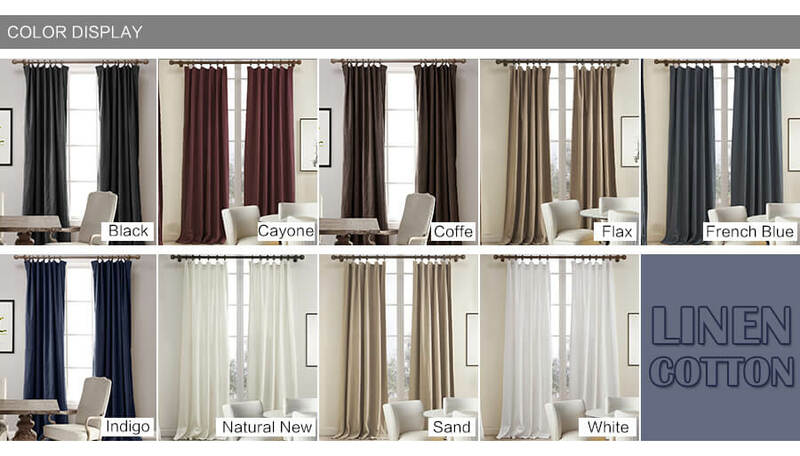 I’ve bought allot of drapes in my life and these are amazing. The price is amazing! They are very thick and well made. Highly recommend. These curtains are great, I love them..they are well worth the price! I love the texture and quality of my new drapes! I like everything about them. They look great. The quality is the best. The workmanship is perfect. Only thing I wish they came in different widths. 50 wide was barely enough to cover window w/o an overlap to cover the morning sun.